I picked up the third glass computer desk on the weekend. This gives me the set of three I need to run along the family room wall. 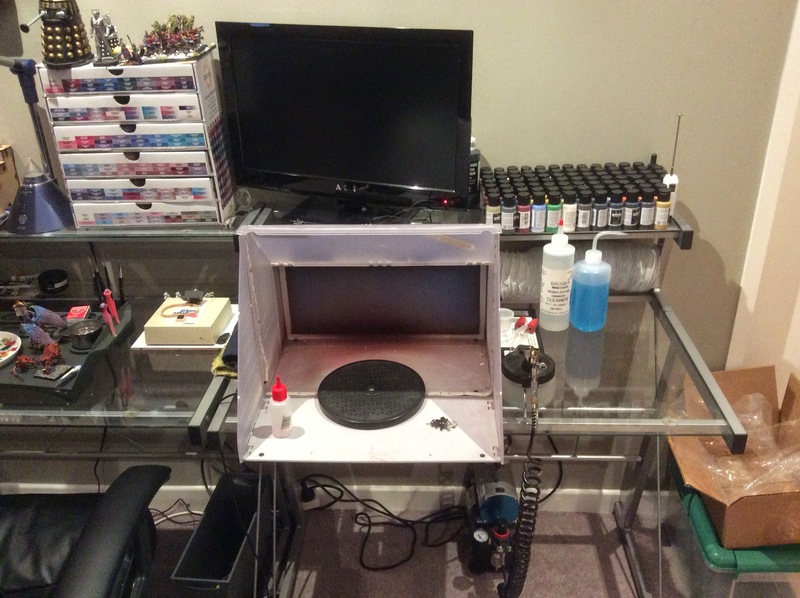 It gives me "making area"' a paint station and the airbrush booth. On the near desk is the booth. I fitted a strip of LED lights in it to give it some extra light. You can see the vented hose at rear which runs to cat door when necessary. Here is the side on view which shows it is quite tight into the wall but about ten feet long. The spray booth area. I ordered a rack for the Badger paints which will hopefully arrive early next week. It is large enough to take all 80 and will stand against the wall. TV sits behind the both and using Chromecast I can stream the TV and net. The compressor is on the floor beneath the desk. Given it has a tank it is relatively quiet. 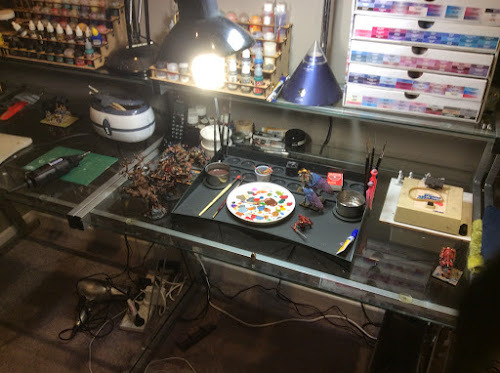 The middle desk is my painting station. 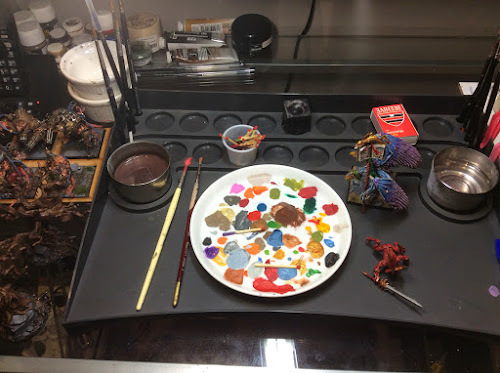 I jumped for a GW Citadel Paint Tray and it's been a good investment. I've found it keeps the desk much tidier - which I need - and let's me work more productively. My paint shaker is on the right. 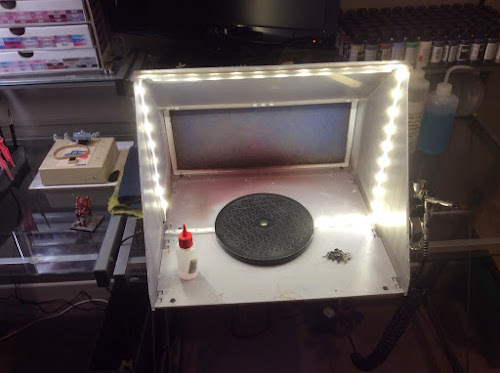 This is almost a necessity when using GW paints as they constantly need remixing. The box on the right is the GW paint set while the mdf rack has some Vallejo Model Colours, old Game Colours etc. On the right is my "work" table. 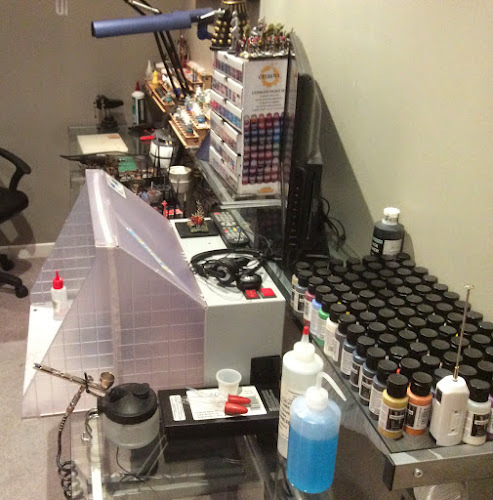 This is where I assemble models, base them and generally hobby out. 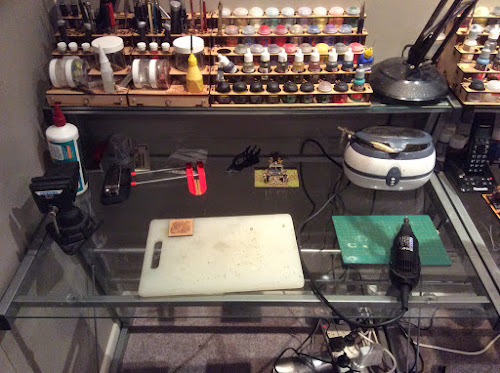 On the desk you can see my cutting boards, my Dremel, a vice and my ultrasonic cleaner. 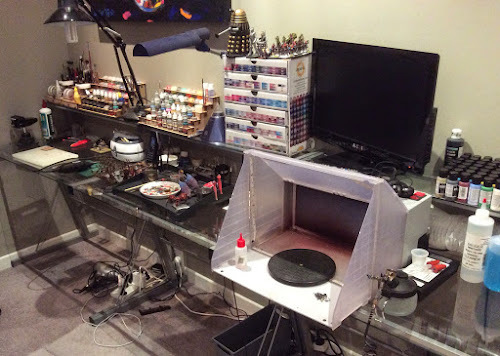 The mdf racks have more paints and my assortment of hobby tools. Here's my lighting on the paint desk. I have a UV natural light lamp and a swing lamp with a daylight lamp. I bought some led strip lights which I've fitted in my both to give extra lighting. Tends to remove a lot of shadows. 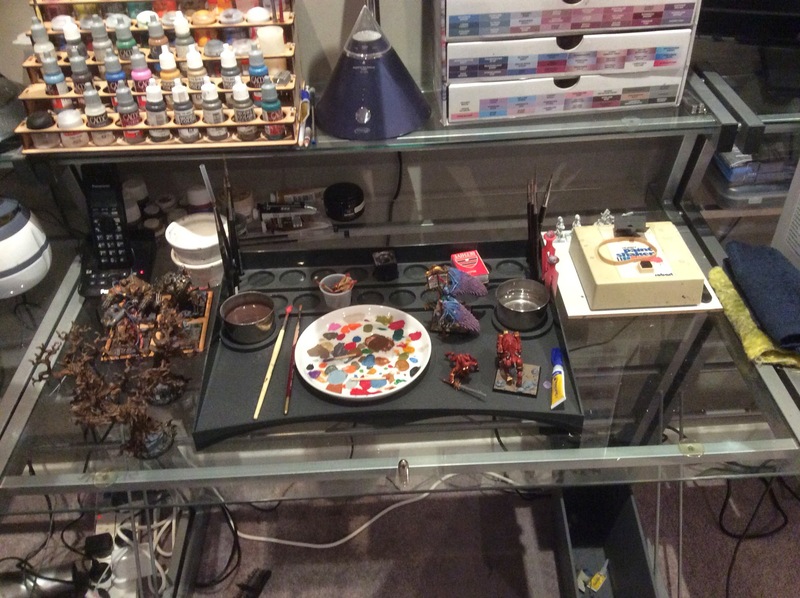 Final shot shows the painting table ready for action. Hope that gives a feel for what I've now got up and running. wow, that is an awesome set up. This must be what hobby envy feels like. What is that conical thing on the middle shelf, the one with the clear cap on the top?